Hello! It's Inspiration and Release Week! Yes it's the holidays but Lawn Fawn has some fun Valentine goodies releasing this week! 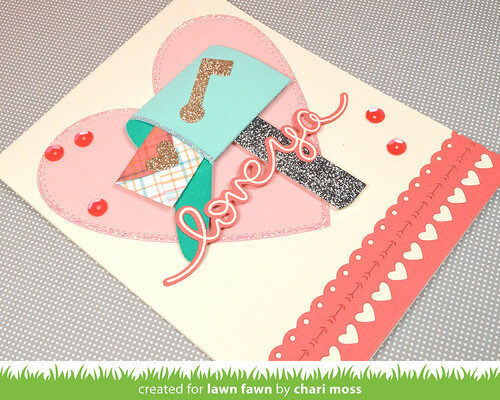 Today we I'm creating with the new set Love Letters and new die set Happy Mail. Love the cute little birds in the Love Letters set and all the ways they can send love letters. 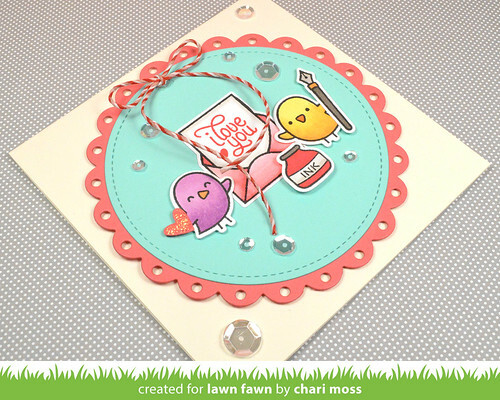 I created this little card using the new Fancy Scalloped Circles to frame my little birds writing love letters. I sprinkled clear sequins in a variety of sizes to add some sparkle and shine. My second card uses the new Happy Mail die set. These dies let you make a cute little mail box as well as the envelope that fits inside. I paired my pretty mermaid mailbox with a Big Scripty Word sentiment and the new Valentine Borders at the bottom. Be sure to check out the Lawn Fawn Blog for more projects using these new products as well as giveaways! All these new products will be released on Thursday the 15th. Soooo lovely!!! The mail box is super cute!!! Two very fun cards! Love the glitter on the mailbox! Thanks for sharing.